Those of you who have been visiting my blog since the very early days might remember back in 2008 when we bought goldfish for the four oldest (which were their very first pets), named the goldfish, mourned the loss of Mr. Peter Nemo, quickly followed by the loss of Princess and Flower. Rascal's fish Sparkle, however, lived a very long life which came to an end this afternoon... Yes, today was another sad day, especially for Rascal, when he discovered that his fish had died! The boys have planned the burial for tomorrow. 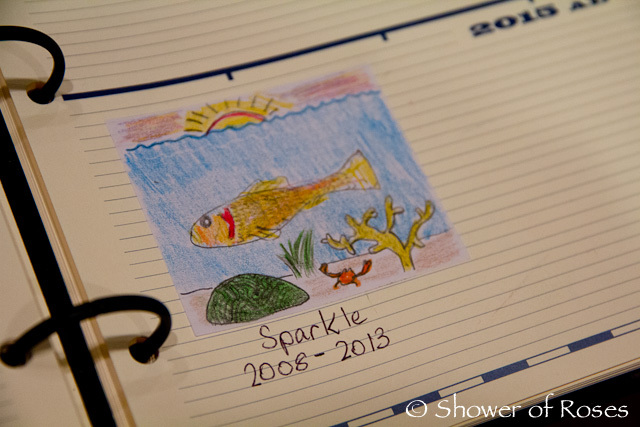 In the meantime Rascal added Sparkle to his timeline to remember forever... I sure love these sweet, sentimental children of ours! Five years is an impressive life span for a goldfish! I bet Rascal must be so sad that his pet has passed. His drawing is so sweet. I'm so sorry for your loss. He must have really enjoyed your family while he was with you! This is going to sound crazy, but we had a fish named Peter Nemo too! He was a beta fish that we took home from our good friend's wedding. There were twelve tables at the reception and each one had a bowl in the center with a beta fish in it. They joked that they named all the fish after the twelve apostles so when the kids asked who we got they told them "Peter". Then our children added on their own name "Nemo". He lasted for over three years and a was a wonderful first pet. That's a wonderful long life for a fish! Poor little Rascal, though. Bless his heart. He should take pride in having taken such good care of him! Jess I am thinking of homeschooling my 13 year old son with Asperger's syndrome. We cannot afford Catholic school and he is really not doing well at all in school this year--picking up lots of worldly things, mouthing off to staff and parents, and failing almost everything. However, I'm not sure I would be prepared, as I am horrible at math--never got much past simple algebra and simple percents--anything beyond that is beyond me. Is there help available for moms who homeschool but who are weak themselves in certain subjects? Kerry, there is so much available now to help with homeschooling. When you start looking I think you will be surprised! My children are currently using Teaching Textbooks, which makes it very easy for the teacher, since the lecture is given on the computer and the lessons are automatically graded. I've heard that Saxon has come out with DVD's as well to go along with their program. Tutors are also possibly an option. I know I hope to have a math (and science) tutor for my boys when they get to high school, if needed. (I also have not studied much Algebra... I was homeschooled until I went to work full time at 16, getting my GED. Though it wasn't ideal, I had no trouble getting into college when I was 19.) I am very thankful for all the great programs out there for moms like me, that aren't very strong in certain subjects.